Georgia’s experience with The Road Home helped her carve a new path for herself and her daughter in housing, education, parenting and her career. I wanted to share my experience with the Rapid Rehousing program, a collaboration through The Road Home, YWCA, The Salvation Army and United Way of Dane County, with funding from the Predolin Foundation. In 2014, I became a participant of this program through The Road Home after being referred by ECI- Early Childhood Initiative. When I entered the program I was a new mother of a daughter who was 6 months old. I had come from a broken home with no training of balancing a healthy lifestyle. I was new to both The Road home and ECI programs. 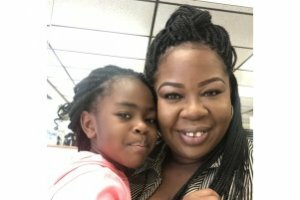 When my case manager, Qiana, and I started working together I struggled with completing my GED, budgeting finances and overall balancing a healthy load between parenting, work, home and school. Working with Qiana Holmes-Abanukam was an amazing and extremely helpful experience. Qiana was able to provide insight, education and program referrals to identify/improve areas of struggle. While in the program, I had repaired a substantial portion of my credit, earned my GED and started the process for obtaining my Associates in Business Management. I have maintained stable housing, employment and overall parenting, work, home and school balance. I have reached all goals set within the program regarding career, education, parenting and housing. After completing both programs through The Road Home and ECI, I feel like I have the tools to help myself and others. Over the past few years, I’ve taken what I’ve learned from these programs and educated family and friends who have expressed improvements in their lives. In the beginning of 2018, I started the process of founding a home care cooperative in the Dane County area to build a space for women with similar backgrounds of hardship, family history or culture barriers. My cooperative isn’t only to provide income but an environment that encourages, educates and will provide opportunities to gain the confidence to create a healthy lifestyle balance. I look back at my life prior to being a part of the Rapid Rehousing program, and a feeling of gratitude overwhelms me. I can truly say this program has been a great inspiration to directing my life to a much healthier, limitless future of opportunities for my daughter and me. The support, tools, and knowledge gained from Qiana has been life changing and my current situation is an example of this.